A lot of couples who have pets before they have babies often have certain apprehensions about the pets and the babies existing in the same house together. The foremost concern for most parents is the baby’s health. However, babies who grow up with pets tend to develop stronger immune systems and in general are less prone to allergies. What most expecting parents want to know is how to prepare a dog for baby’s arrival. Pets can often get stressed and jealous when a new baby arrives. 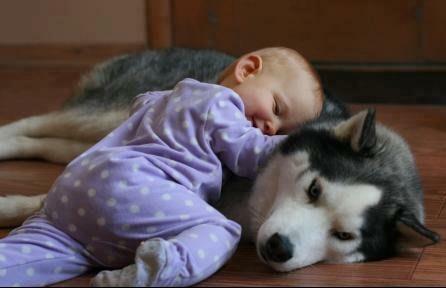 However, you would be surprised to learn that if introduced properly, dogs and newborn babies will get along quite well. However, there is a lot you should to in terms of “prep” before you can introduce your baby to your dog or cat. While dogs and babies get along famously, before the baby is born, the first and most important thing to do is to take your pet to get a thorough exam from a vet. Address any health issues or concerns your pet may have ahead of time. Make sure your pet is regularly de-wormed and vaccinated. Additionally, it is important to tackle any behavioral training issues your pet may have at least 3 months before the baby is born. Preparing your dog for a new baby is a lot like preparing your first born for a new sibling. Give your pets plenty of reassurance and love. Allow them to explore your belly, and talk to them about what it means. Involve your pet as much as you can in your own process of preparing for the baby’s arrival (as you would with a firstborn). Another great tip is to sprinkle baby powder or baby oil (the one you plan to use on your infant) on your skin so that your pet gets accustomed smelling it on you. When the baby finally arrives he/she will take up most of your time and energy which is bound to make your pet feel insecure. The best way to prepare them for this is to slowly start spending a little less time with them. Suddenly neglecting them, scolding and punishing after the baby comes is going to have negative emotional effects on your pet. They may even start acting out, and the last thing you want as a new mother is to clean up dog poop from under the bed. If you are planning to hire someone to look after or walk the dog, don’t wait till the baby comes. Get your pet accustomed to that person well in advance so that they don’t see it as a consequence of the new baby’s arrival. If the pet is very attached to Mommy, another member of the family should take over this role gradually. Start by feeding and walking the dog. Spend a little quality time with them every day even if it is only a few minutes. Playing games like “fetch,” “hide and seek” and plain old chasing can do wonders for a human-dog relationship. When the baby comes, the dog might be a little less inclined to sulk and you can be assured that there will be no emotional scarring if the transfer is done properly. This may not be a possibility for everyone, but if you can, invite friends with babies and children over as often as you can so that your dog gets accustomed to being around babies. If this is not a possibility for you, you can familiarize your dog or cat with baby noises by playing videos of babies or recordings of baby crying sounds. A neat trick is to allow your dog or cat to investigate your newborn’s blanket or item of clothing (anything with the baby’s smell on it) before you bring the baby home. When your baby comes home, have someone take him to his room while you greet your pet and calm him down. When you feel like your pet is calm enough to meet the baby, you can allow your pet to sniff (but not lick) your little bundle of joy. Keep treats handy so that you can reward good behavior. Try to associate the arrival of the baby with positive feelings. You can allow the dog to sit next to you while you sit with the baby during play time or even when you are feeding the baby. If you foresee jumping and hyperactive excitement, it will be well worth investing in a dog or cat trainer. Be it a dog or a cat, any prep that you do must be done well in advance so your pets don’t feel neglected and displaced. It is important to remember that no matter how well you prepare your pet, when the baby arrives, there will be adjustment issues.